Those poor antennas, they live a terrible life. Out in the wind, rain, ice and sludge. Any postal worker could identify with them. But they are probably the most overlooked part of an avionics system, yet the most important. Except for a few boxes (autopilots, etc. ), avionics rely on antennas to talk with the outside world. Knowing their position, function and limitations may help explain some weird problems that may appear. Most pilots can be dated by their terminology of these protrusions and lightning rods. The old timers call them aerials, but the term is gaining strength again. Today these aerials come in many different shapes and sizes. Different antenna manufacturers will use different shapes, but they’re all basically shaped for their function. Often, a well-equipped airplane will have an antenna farm on the belly, and trying to figure out what each antenna does can be confusing. But taken one by one, those antennas all have different shapes because of their specific jobs. The frequencies that they operate, and directional qualities usually determine their shape and place. Communication antennas are basic in operation and have relatively few problems, except for delamination (more on that later). Each Comm transmitter has its own antenna, mostly for redundancy and a couple of technical issues. They can be mounted on either the top or bottom of the aircraft, but each installation is susceptible to shadowing from the fuselage. Shadowing is caused by structure in the transmitting path of the antenna, caused by various fins or gear doors. Know where your antennas are and how shadowing may effect their range and coverage. If you have Comm antennas on the top and bottom of the aircraft, it helps to determine which antenna feeds either radio. Therefore, the radio that feeds the top antenna would be better for communications while the aircraft is still on the ground, and the antenna on the bottom would be better for communications while airborne, having a clear shot of the ground antenna site in each case. Some Cessna twins had a Comm antenna buried in the vertical stabilizer, which limited their range, and coverage. The Loran antenna is similar in size to the Comm antenna and sometimes the exact same shape, but they are different inside. Most of the modern Loran antennas have an amplifier built into the base to boost the signal, while some of the older systems use a small amplifier mounted just inside the skin. It can be either top or bottom mounted but the receiver must be configured for the antenna position. Often a Loran signal problem can be discovered by bumping the antenna with your hand (no baseball bats here) while watching the signal levels on the Loran display. A drop in signal levels signifies a defective antenna or amplifier. Loran systems are also susceptible to P-static interference, caused by a build-up of electrical charges as the aircraft flies through rain or dust in the atmosphere. P-static can be greatly reduced by proper bonding of antennas and airframe structures, especially the grounding straps between a control surface and the structure. Those static wicks on the wingtips and tails are used to dissipate the static build-up, but are susceptible to bonding and deterioration problems. They may not look deteriorated to you, but to an electron, a little bit of corrosion can render them useless. Those vinyl stickers on the vertical fin are another little known problem that often drives an avionics technician toward the aspirin bottle. They have a tendency to attract static build-up and cause all kinds of interference. Loop antennas are shaped liked they are named, in a continuous loop. They have the ability to determine which direction a signal is coming from, hence they are also called directional antennas. Most have two or three separate coils of very thin wire wound at varying angles to each other in the shape of a bagel laid flat. The signal is received at different strengths between the coils, and the receiver uses those different signal strengths to determine the direction from which those signals originated. The ADF uses this type of antenna, as well as lightning-detection systems. Although most of the older ADF receivers also need a long wire antenna (sense) to resolve any 180° errors inherent in loop antennas, the newer loop antennas combine the loop and the sense wire in the same package. Because of the flat bagel shape, most loop antennas are wide and short and usually live on the bottom of an aircraft, but can be mounted on the top. These antennas suffer from delamination because they commonly hold water and oil that collect within the case. A good seal job before water can accumulate goes a long way to increase the life of these antennas. Lightning detection antennas (Stormscope, StrikeFinders, etc.) have special mounting problems because their job is to detect and amplify noise, any noise, including ignition systems, alternators, loose skin panels and of course atmospheric noise (lightning). The intent of these lightning detection systems is to filter out the non-atmospheric noises, but sometimes aircraft produced noises overwhelm the detection systems and “ghost storms” are displayed that seem to always follow the aircraft wherever it goes. So antenna placement is critical, even to the point that the entire aircraft should be electrically mapped for noise before mounting an antenna. Sometimes the source needs to be located and repaired, many times replacing the entire engine ignition system. Marker beacon signals are highly directional, which means you have to be almost directly over the transmitting ground station, therefore the marker beacon antennas need to be on the bottom of the aircraft. There are a few different types of marker antennas, the more common types look like little canoes about ten inches long. The marker beacon system has a relatively simple antenna system and is pretty reliable, but they have the same delaminating problems as other antennas (I promise I’ll get to it). Cessna used flush antennas for some installations, appearing as a flat plate under the empennage, and they also used an antenna that consisted of a thick wire that protruded straight down out of the empennage then made a turn toward the tail. Both of those types have very few problems. 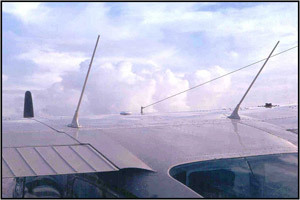 UHF antennas are commonly used for transponders and DMEs and are always found on the bottom of the aircraft. They are about four inches long and the same antenna is used for both systems because the transponder frequency is in the middle of the DME frequency band. Two types are commonly used, spike (figure at right) and blade types (figure at left). The spike should only be used for transponders, because the antenna length is tuned to one frequency, the transponder frequency. The blade antenna is also called a broad band antenna because it is tuned for a range of DME frequencies. A spike would not work very well for a DME. The blade antennas are preferred because the radiation pattern is better and ice formation is less likely to break them. The spikes are prone to cake-up with oil, reducing the transmitting range. Often, just cleaning a spike antenna will double your transponder range and get rid of those intermittent mode-C problems. The reason is that the ground secondary radars need only one sweep to determine your squawk code (mode-A), but they need two good sweeps to determine altitude information (mode-C). Hence, a dirty antenna may not transmit a good signal reliably. This goes for all antennas, a dirty antenna will not perform up to its potential. The spike antennas are also susceptible to breaking from an errant scrub brush. After the antenna is broken from its mount, it can be reinserted without any owner the wiser, only to find out later that the replies are intermittent. Landing gear doors often shadow these small antennas, so check your aircraft to determine if your DME might drop-out from the side or front, when the gear is down. The blade antennas are susceptible to delamination and this tends to de-tune the frequency response and distort the transmitted signal. Which is why the biannual transponder check is so important. A de-tuned transponder signal will be rejected by the ATC radar receivers and lead to intermittent problems. The Nav antenna is almost always mounted on the vertical tail. One of the exceptions are the V-tail Bonanzas, that use a top mounted combination antenna that contains both a Nav and Comm antenna (figure at right). There are three types of Nav antennas, the cat whisker, the dual blade and the towel bar. The cat whisker consists of a couple of rods jutting-out from each side of the vertical stabilizer at a 45° angle (figure at left). The cat whisker antenna is poor at receiving signals from the side, and was developed for aircraft that fly low and commonly track either To or From a station. The dual blade is just that, two blades, one on each side of the tail (figure at right). The towel bar resembles the common bathroom fixture, one on each side of the tail. The blade and towel bar antennas are both “balanced loop” designs, which have equal receiving sensitivity from all directions. A balanced loop antenna is required for RNAV systems, which rely on receiving stations much to the side of the aircraft. The single Nav antenna almost always feeds both Nav receivers and sometimes the glideslope as well. Therefore, a failure in the Nav antenna system would cause both systems to go down. In rare instances this same antenna also feeds the marker beacon but problems are created when the horizontal tail shadows the antenna from the marker beacon transmitter. The GPS satellites transmit less than 5 watts of power, so by the time the signal reaches you, it is very, very small. Because of this, the GPS antenna has a built-in amplifier to boost the signal for the receiver. 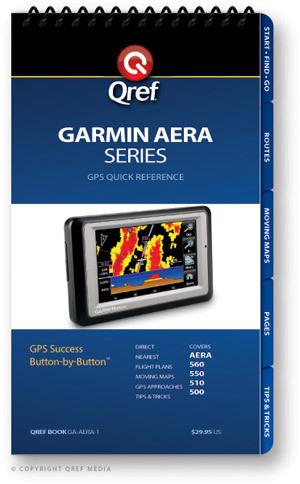 Additionally, the GPS frequency is so high (in the Ghz band), that the signals travel in a line-of-sight manner. This makes receiving the signal susceptible to airframe shadowing, thus mandating that a GPS antenna be mounted at the very top of the fuselage. The Comms cause a lot of interfere with the GPS, both through the antennas and panel mounting near each other. Since these GPS signals are so small, and the Comm signal is so very powerful (in relation), there is a lot of interference from the Comm. In fact, an approach approved GPS is tested for Comm interference during installation. Most of those tests barely pass. Therefore, it is important that the Comm and GPS antennas be mounted as far apart as possible. Sometimes a Comm antenna must be relocated to the bottom of the aircraft. 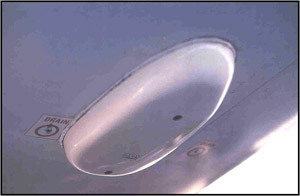 Those suction-cup antennas, common with handheld GPSs, are shadowed by the aircraft structure when placed in the window. Even if enough satellites are being tracked in level flight, a turn will cause some satellites to drop-out. The suction-cup also tends to fall during turbulence. This is just one of the many reasons why IFR certification with a handheld GPS will be difficult to achieve, if not impossible (but the future is always surprising). Hopefully, you’ll never get to use an Emergency Locator antenna, but in case you do, they are especially designed to survive an unscheduled landing (FAA term for a crash). They are almost always on the upper skin of the empennage and are made of a pretty flexible material. There are a few exceptions though, some may be buried in the vertical tail or look like small Comm antennas. Radar altimeter antennas are pretty simple, comprising either a single antenna system or dual antenna system. They look like plates about six inches square and live on the bottom of the aircraft. The radar signal is transmitted straight down to bounce off the ground. The time between transmitting and receiving the signal is measured, and used to determine the distance above the ground. Because of the high frequencies involved, a good electrical bond with the aircraft skin is important, otherwise a poor bond may allow the system to talk to itself, which causes false readings. Many factors influence antenna performance. Of course the physical condition of the antenna plays an important role. If the antenna is cracked or the paint worn off, water may enter and cause delamination (a separation of the composite layers), which may render the antenna useless. Another problem deals with the underlying structure and electrical metal bonding. If the antenna base is not structurally strong, the antenna will vibrate from the slipstream and cause the skin to fatigue. Eventually this would cause cracks and possibly rip the antenna off the fuselage, especially if there is ice build-up on the antenna. A riveted doubler plate under the antenna base will prevent the vibration and work-hardening of the skin. The antenna must also be electrically grounded (bonded) to the airframe, so a good electrical connection is maintained. If some corrosion gets underneath the antenna, this bond may be compromised and the antenna’s efficiency may degrade to the point that a Comm may only transmit a couple of miles. Without a seal around the antenna, water would creep under the antenna and cause corrosion in a very short time. This bonding is practically non-existent if a mechanic uses a sealant under the antenna, trying to curb corrosion. The proper bond is a bare metal skin to antenna mating surface with sealant around the base of the antenna. In addition to a skin doubler and good electrical bonding, a transmitting antenna also needs an effective ground plane. To transmit correctly, a quarter wave antenna (the antenna is one quarter the length of the electromagnetic wave) needs an electrically bonded structure around it with a radius equal to the antenna length. In other words, lay the antenna down and scribe a circle. This is the amount of metal (ground plane) that the antenna needs around it to work properly. Those of you with composite aircraft still need this ground plane, often consisting of a metal plate just inside the skin. For instance, if a Comm antenna is two feet long, it must have two feet of metal around it. Just a few of those transmitting antennas are the Comm, DME, Transponder, ELT, radar altimeter, phone and HF. Another problem is paint. Antennas should never be painted over their original coatings. Any paint build-up would reduce the efficiency of an antenna. Transmitting antennas are particularly sensitive to paint problems, especially metallic paint. There is always the exception to the rule when it comes to antenna shapes and their mounting, especially in the kit-built aircraft arena. There are some real interesting innovations for hiding antennas under those fiberglass skins. This article just highlighted some the more common antennas, but there are many more systems that require antennas, all with different kinds of shapes. Real estate is very scarce on an aircraft, and sometimes there is very little left for antennas. Helicopters and seaplanes have precious little areas to work with and antenna placement is very important, often making an avionics install technician run for the aspirin. Every antenna location is a compromise between a solid mounting, shadowing, other antenna interference, ground planes and aerodynamics. But with a little knowledge of their limitations and care, they will live a good life that any postal worker would envy. So if you’re contemplating a new avionics installation, don’t skimp on the antennas, they’re your link to all those good waves out there in the atmosphere.